Not only will doing this properly this allow your wood burning tips to last longer, but it will result in an end product that is of higher quality, and isn’t a great end result the ultimate goal with this craft? 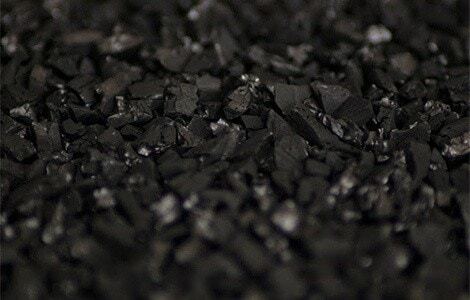 When you burn organic material (including wood), carbon is naturally created as a byproduct (for those who are interested in the science behind this process, read more here). Carbon is a harmless natural element, but it’s not good at conducting heat or power. For woodburners, this reaction creates a small inconvenience. In order for shading to look good on your finished product, you have to work with a shiny clean and nice pen tip. This will let the heat travel in a smoother and more reliable way, leading to consistently better results in your woodburning work. 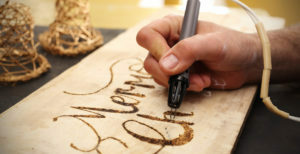 The first step, of course, is making sure you have a quality wood burning pen, but that’s just the beginning. When you’ve been using your tip for a while, you will eventually notice that your pen is not functioning as well as before and that the lines are not as precise or smooth. That’s your signal that it’s time to clean them. One quick solution to this is to simply rotate your pen and use a different part of the tip. Eventually, however, all of the tip’s sides will have a layer of carbon built up on them. Luckily, it’s easy to fix with proper cleaning techniques. The best way to get rid of carbon buildup is to prevent more from forming than is necessary. 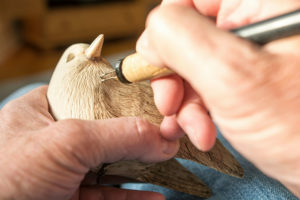 First of all, try using a piece of wood that doesn’t have any retained sap, as this type of wood will have resin or sap come out of the pores when heated up with the wood burning tip. 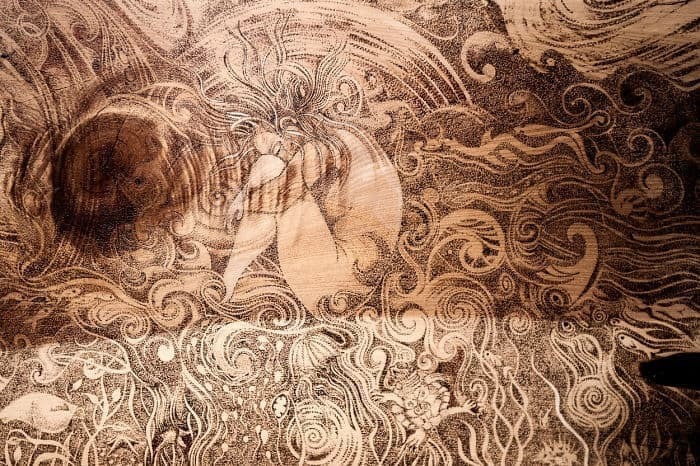 This sap or resin can gum up your wood burning tip, making it hard to clean later, and in the worst case even smudging and ruining your art piece. As you use your pen, you can use sandpaper (320 grit) to brush the buildup or residue off the tip. 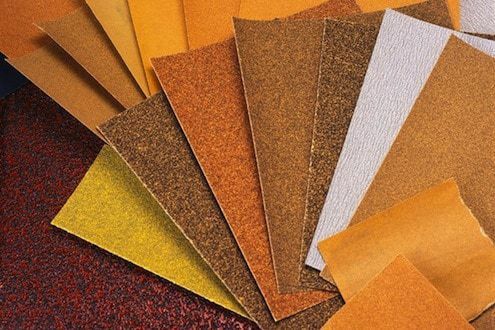 Rougher grades of sandpaper are not recommended. If this is done while your tip is still hot, try not to use your hand to hold the paper or touch it for longer than a moment. 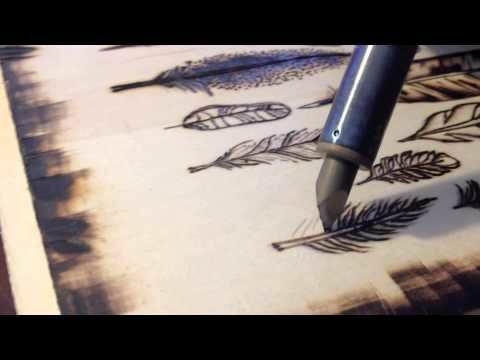 This is fine to do every so often, but keep in mind that using sandpaper too much can cause your pen tip to wear down faster. Another option for cleaning your tip is to use a knife to remove the carbon buildup. Scrape off the residue over some scrap wood or paper to prevent mess. 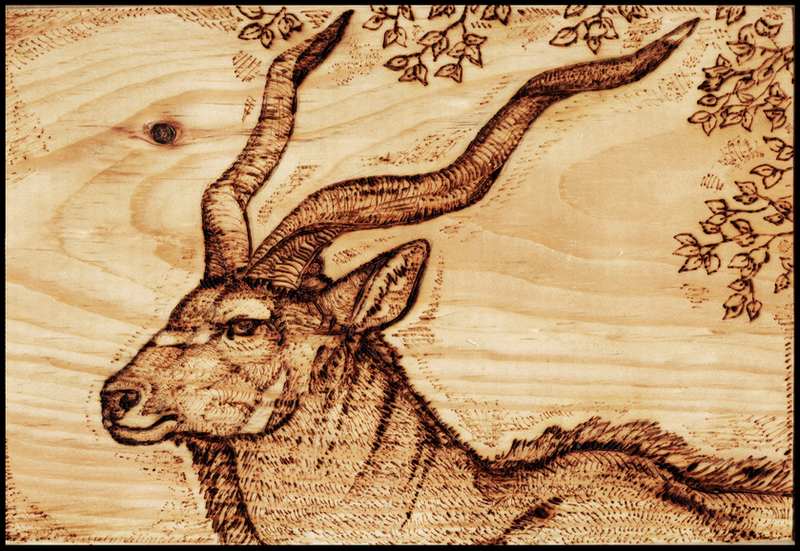 When you return to your wood burning, your tip will conduct heat better and work more smoothly. Some prefer to get rid of carbon buildup on their pen tips by cranking up their temperature to burn it off. This is also fine to do every once in a while, but higher heats like this, over time, can also wear out tips more quickly than necessary, so do it sparingly. 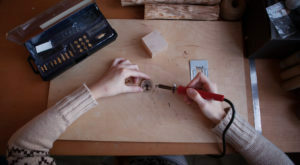 The final (and best) method for getting your wood burning tips nice and clean is using jeweler’s rouge (or polishing compound). This is not as quick as the other methods, but it’s less abrasive, safer for delicate tips, and just as effective. 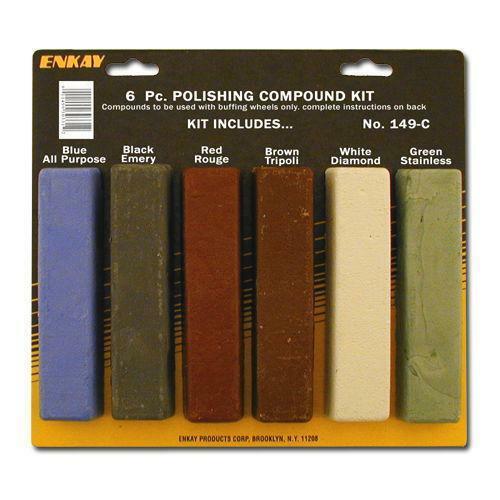 You can use a coarse green rouge for everyday use and a finer red rouge to give your tip a finishing polish. For a more detailed guide on using jeweler’s rouge, including information on differing types, check out this article. 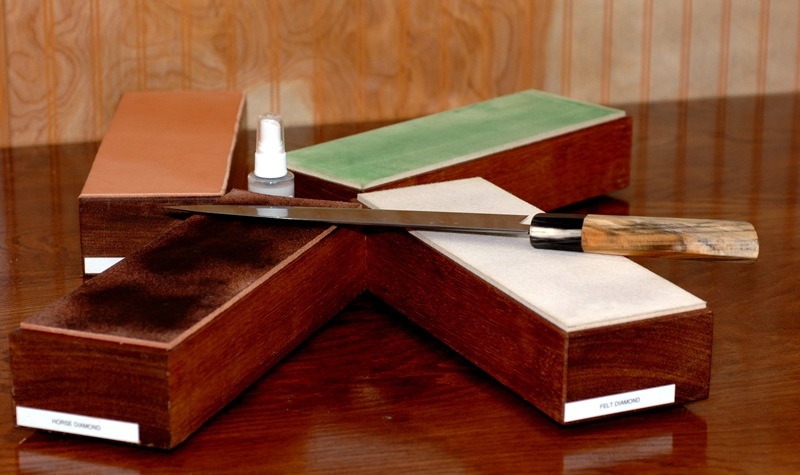 You can also use a leather bench strop in addition to these techniques, similar to what you would use for sharpening knives. If you don’t have one, however, you can simply use a rough piece of leather to get your tip nice and polished. 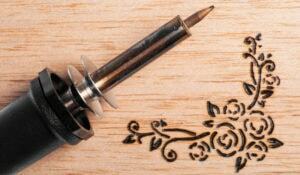 When you are wood burning acidic types of wood, such as oak, you may notice quicker corrosion of your pen tips. When you polish them and keep them clean, you can eliminate pit marks while making it harder for the carbon to stick to the tips. Once your tip is cleaned, it should be functioning like new. If you notice that it still isn’t, make sure that it’s tightened to the pen all the way. Since most wood burning pen tips are a screw-on design, they come loose at times which can reduce their burning ability and conductivity. Keep some pliers nearby and use them to tighten your tips when needed, as you work. Be sure not to over-tighten since they can break while hot. Follow these guidelines and your tips will remain in great shape.